Here's some concept art from Backbone Entertainment's rejected Streets of Rage reboot. Reboots are in. The promise of the nostalgia dollar has most big developers digging through their couch cushions for discarded IPs. One exception is former 16-bit titan, Sega. The house that Sonic built has left its back catalog relatively unmolested, save for the occasional straight-port re-release and, oh god, that Golden Axe reboot. Now, it turns out that Backbone Entertainment, an outfit known mainly for its HD ports of Capcom's fighting games, pitched a reboot of 16-bit, brawler classic Streets of Rage (or Bare Knuckle if you prefer). Despite the fact a new Streets of Rage game is almost guaranteed bank at this point, 2008's Castle Crashers having sparked a kind of brawler renaissance, Sega rejected the idea. Artist, Arvin Bautista, has released a handful of concept art pics included in the pitch, as well as a mock-up of what appears to be an updated version of E-Swat. The art itself is charmingly goofy, penned with the same hand-drawn-and-coloured style found in Sonic the Comic back in the day. 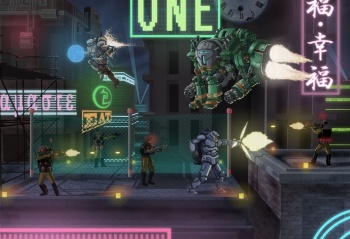 Personally, while I'm not sure Backbone are the right team for the job (two words; "Way" and "Forward"), I'd love to see a modern take on Streets of Rage, albeit one more in the vein of Bionic Commando Rearmed or Double Dragon Neon than, say, Golden Axe.